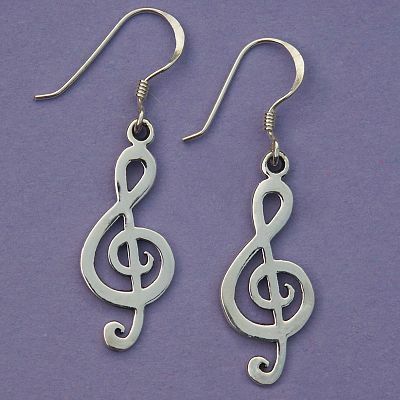 - Musicians and music lovers alike will be thrilled with these Silver Treble Clef Earrings. 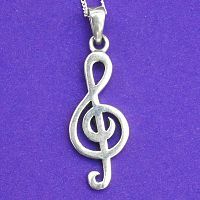 The graceful curves of the G clef, or treble clef, have become a familiar symbol for music in general, in addition to their more specific meaning. 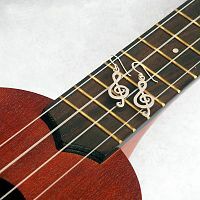 So whether these earrings are for a seasoned performer, or just a casual listener, the design is instantly recognizable. These little beauties will be music to your ears. The sterling silver earrings measure 1 1/2" tall, including the French hooks. For pierced ears only. Who would love these earrings? of course! Aw, who am I kidding? ANYONE would love these earrings! 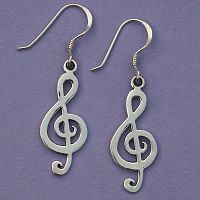 Do you have any other questions about our Silver Treble Clef Earrings?